We offer 12 MT capacity Single acting and Double acting Hydraulic Tank jacking equipment complete with all accessories and Hydraulic Power Packs for construction of new tanks, repairs of bottom plates or tank foundations of old tanks, dismantling of tanks. These products are featured with robust construction, corrosion resistance, dimensional accuracy and high functionality. Our well equipped manufacturing and testing facility at Kalher, Bhiwandi, Dist Thane, India. 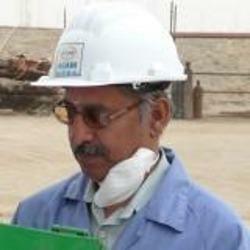 We have a strong manufacturing team with strict quality control engineers. We use premium quality material to manufacture the product range and maintain international standards in our entire production process. Our office has experienced structural design engineers to provide correct selection of the units required for a tank depending on the work. We have a team of experienced tank jack operators and jack technicians. 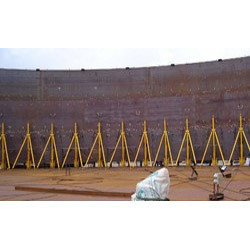 Erection of all types of vertical storage steel tanks. Repairs and replacement of tank annular and bottom plates. Replacement of corroded first shell course plates. 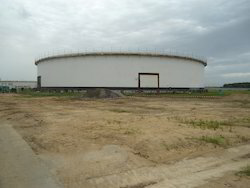 Safe Dismantling /demolishing of tank at any location. Vacuum box test unit with vacuum pump are required for testing of tank bottom plate weld joints and shell to bottom weld joints as per API 650 codes.